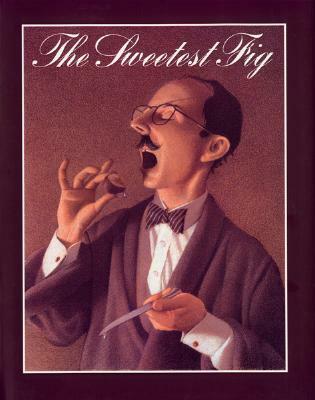 The Sweetest Fig is a wickedly funny fable about greed and kindness. Monsieur Bibot is a dentist–a tad fussy in both his personal and professional life. He is more concerned with his own needs and wants than with those of his pet dog, Marcel, or his clients. When an old woman, unable to pay for his dental services offers him magic figs instead, M. Bibot rushes her out of his office–without the pain medication he has promised, since she has no money to pay for it. The old woman has told M. Bibot that the figs are magic and “will make your dreams come true” but he does not believe her. Then, the morning after he eats one of the figs, M. Bibot realizes the figs are magical indeed! He also realizes that the figs’ magic is literally to “make your dreams come true” not necessarily your wishes. He sets about preparing to make the two things the same in order to capitalize on the power of the figs. In the end, M. Bibot’s selfishness and disregard for others is the pivotal factor in the unexpected and wholly satisfying ending to his story. As always, VanAllsburg’s illustrations are exquisite and capture Paris, the dentist’s office, Bibot, his dog Marcel and his elderly client in mid-breath right on the pages. This is a fantastic read-aloud at home or in the classroom. Frankly, I don’t know how I missed this one for so long and intend to add it to my own collection. It is one I know I will re-read to myself and to many others as well.